It started as an itch, probably years before you even noticed it. Music, but more specifically, your desire to play it. We all listen to music in our cars, in the shower, or walking through the airport. A few of us pay more attention. It becomes a driving force in our lives. It isn’t long before you purchased your first guitar and began playing. Maybe you had a friend that taught you. Maybe you picked up a book, or even went as far as taking lessons. You learned your open chords and honed your strumming. You even joined an online guitar educational site called JamPlay. Where does that leave you now, however? If you’re thinking in a progressive nature, like most do, you’re probably wondering about recording. You’ve spent so much time practicing and working on your guitar chops that you may find yourself with more questions than answers. Not the least of which is why would I record myself and how much is this going to cost me? Lets start with the why. Truth be told, outside of making your own music, there’s quite a number of reasons that you may want to record your playing. Practice makes perfect, but in reality, only perfect practice makes perfect. How’s your rhythm? Are you hitting all the notes? Are you forgetting to mute that low E string? You spend so much time paying attention to what your hands are doing that you may miss something they’re not doing. In this instance, recording your practice sessions provides an unbiased look at what you’re really practicing. Valuable enough to turn good practice into perfect practice. Along with its obvious practice benefits, recording also has a way of sparking creativity. Have you even woken up with a melody in your head? Have you ever stumbled across an insane riff, or inspiring progression only to have it fade away as quickly as it came? One push of a tiny red button and that moment of genius is no longer lost. Instead it only waits for you to build upon it. So, How much is this going to cost me? Well, that depends on a few variables. How far do you want to take your recordings? Do you want to build full compositions or just review your practice? The truth is that if you already own a tape recorder or a computer, you can record yourself for little to no additional cost. Conversely, you can spend many thousands of dollars on the latest and greatest recording gear. Within this article series I will touch on both extremes, but instead will focus primarily on setting up a modest home recording studio able to record basic practice routines, or build master compositions. Now that you know the why, lets focus on the how. Although a simple tape recorder can record your sessions, for the purpose of building a studio we need to go a few steps further. For the most basic of recording we need two items. First is a way to transfer the audio signal to your computer. Second is a program to capture the incoming signal. For an acoustic guitar this means you need a microphone. Most computers built and sold by around 1995 include a basic speech oriented microphone that plugs into the line in port on your computer’s sound card. While not an ideal microphone for recording a musical instrument, it will suffice as a low to no cost recording device. If you’ve got kids (or are a kid yourself) you might have Rock Band and it’s microphone laying around. This USB microphone although still designed for voice applications is a better solution. For an electric guitar you can use the above microphones to mic your amplifier. Another option here is to purchase a 1/4” to 1/8” TRS reducer. You lack a pre-amplifier to boost the signal from your guitar, but simply using this reducer to plug your guitar directly into your computer’s line in port also works. You can now send an audio signal from your guitar to your computer. You’re not quite there yet, you still need a program to capture that signal. A great free solution is an application called Audacity. 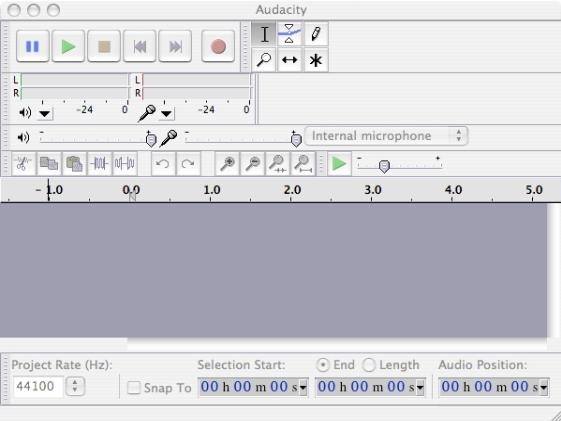 Although free shareware, Audacity offers competent audio recording with surprisingly complete and powerful editing features. I highly recommend this program to anyone looking at venturing into recording. There’s a place for it in even the most dedicated studio. After downloading and installing the audacity software, upon opening you’ll be shown this window. The basic layout of the program is designed to make initial recording quick and effortless. In the middle of the screen you will find a source drop-down menu. As you can see from the image above, on my computer it has automatically selected the only input currently available. Before you can record you need to select your input device. Unless you’re already using a digital audio recording device, internal microphone or line in is going to be your likely choice. With Audacity running and your input device selected, you’re now ready to make your first recording. Clear your head, ready your guitar and press the record button. Once you’re done playing press stop. Congratulations! You’ve just completed your first recording. Admittedly, this is an incredibly basic start on the recording and production process. As this article series continues I will delve further into recording techniques, gear and the applications necessary to record, create and polish your compositions. We’ll discuss gear vs. software, recording techniques and post-production creativity. To get there however, we’ve got to get your home studio up and running. Take some time between now and my next installment to do some research on recording equipment. Who’s using what and why are they using it? Knowledge is power and in this instance more power makes for better recording! As your first weekly assignment, I’d like all of you interested in recording to spend some time recording a few of your practice sessions, or anything that you’re creating yourself. When you’re done post up a comment or two about how you’ve been doing. Did the process run smoothly? Did you run into any problems? Lets hear it.